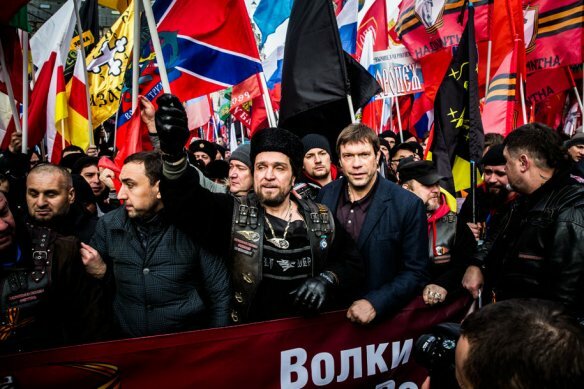 The “patriotic” rally in Moscow was not pretty. Photo Novaya gazeta. It is entirely correct to say that the “Minsk Two” agreement, reached on February 12, after painstakingly long talks between the leaders of Ukraine, Russia, France and Germany, was broken inside the first week of implementation. Yet, as the battle for Debaltseve has drawn to its predictable end, the opposing parties may find it opportune to take a break from the trenches (RBC.ru, February 18). Ukraine has suffered another humiliating defeat, and President Petro Poroshenko needs time to deal with its consequences, though he would perhaps do better by not denying the scale of this tactical disaster (Kommersant, February 21). The rebels also need a few weeks to replenish supplies, and they depend entirely upon the arrival of new echelons of heavy arms and truckloads of “volunteers” from Russia (Kommersant, February 19). Most importantly, President Vladimir Putin needs to prove that his signature on the peace-of-sorts document is worth something and that he is in control of the oscillating crisis.